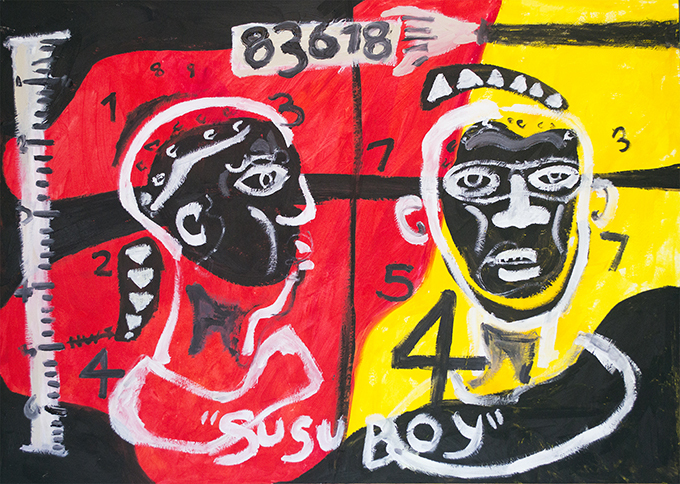 ‘Susu Boy’ by Chiadikōbi Nwaubani, 2018. In the first of a series of guest blogs for the [Re:]Entanglements project, the artist and designer Chiadikōbi Nwaubani introduces his discovery of Northcote Thomas’s photographic archive and how this has provided inspiration for his work. Nwaubani was born in London in 1991 to Igbo parents. He returned with them to live in Nigeria between 1994 and 1997, and subsequently travelled back and forth between the UK and Nigeria. Having encountered many historical photographs of Igbo culture online, mainly digitised from old ethnographic accounts such as N. W. Thomas’s Anthropological Reports, he created the Ukpuru blog in 2010, where he reposts them along with associated information. In this guest blog Chiadikōbi Nwaubani describes how he began experimenting with the archival images and interrogating them through his art practice. ‘Susu Boy’ is Nwaubani’s response to Plate VIII of N. W. Thomas’s Anthropological Report on Sierra Leone, published in 1916. From Thomas’s photographic registers, we know that the subject was in fact Momo Samura. 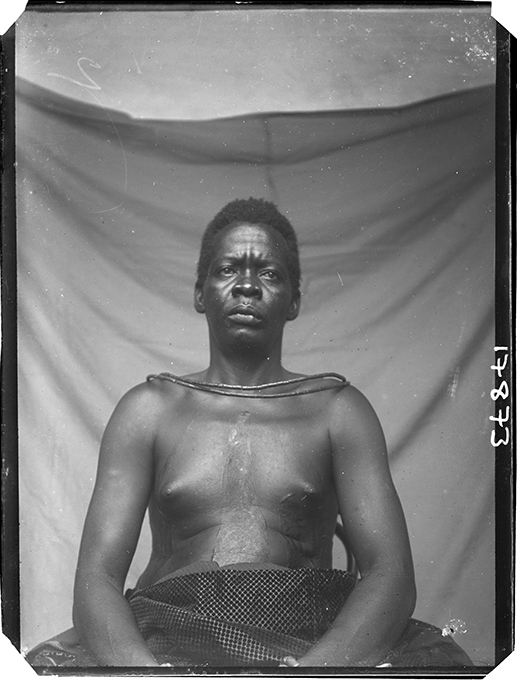 The original photographs, from which the plate was made, were taken in Samaia in the Northern Province of Sierra Leone in May 1914. I became involved in the [Re:]Entanglements project after sharing some of the designs I made with Northcote Thomas’s published photographs online. My initial involvement with Northcote’s work was through the lens of a descendant of the people he depicted in his photographs. I was interested in the ‘physical type’ portraits he made. Even though I was not familiar with the history of this kind of anthropological photograph, I had some idea about the nature of colonialism, which these photographs seemed to affirm. I started the Ukpuru blog in 2010 in which I post old photographs of the Igbo area that I have found online, particularly from early European ethnographies. My interest in ethnography comes from witnessing masquerades in my ancestral home town in Umuahia. The Ekpo masquerades, as they are known, have an imposing presence. The designs of the masks are highly varied and quite detailed. These figures were some of the earliest images I drew. 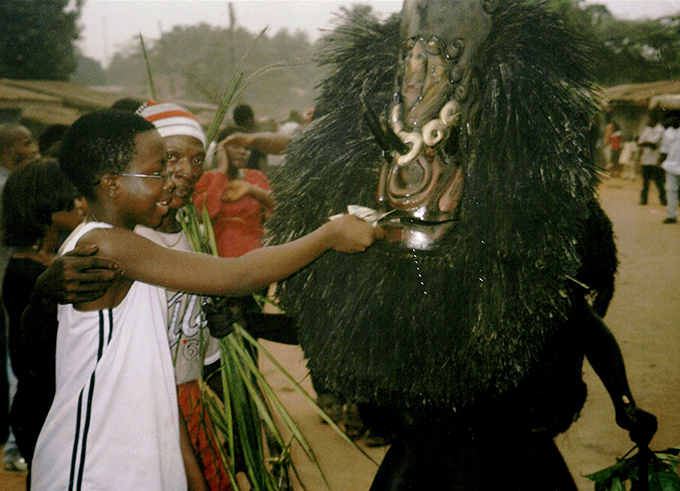 A young Chiadikōbi Nwaubani and Ekpo masquerade in Umuahia, Nigeria. I took some of Northcote Thomas’s published photographs and manipulated them with gradient colours – colours that were quite sharp, like purple and a kind of neon red. These colours gave a lively theme to the photos, and also a pop art feel. In this way, I feel that the subjects are transported from being a ‘type’ into being a symbol of history – both colonial and indigenous… a kind of vision of the past. A contemporary vision of the past? N. W. Thomas’s anthropological photographs reworked by Chiadikōbi Nwaubani. More recently I have been making paintings on paper, which bring out stronger themes. My use of black for fleshing out figures, not only draws out the focus on race, but also seems quite similar to Ekpo masks – these represent ghosts and ancestral spirits. The first of this type of painting I made was ‘Susu Boy’. When I first saw the photograph in Thomas’s Anthropological Report, it struck me as a kind of lonely looking study of the young man because of where he was positioned in the book. There is no name in the caption. The only information left for the viewer is the man’s features, particularly ones that are suggested to be racial, and also his skin colour. With so little information, I am led to imagine what might be happening ‘off camera’, in the margins. What happened just before the photo was taken? Or just after? What was the nature of the relationship between the man photographed and the photographer? 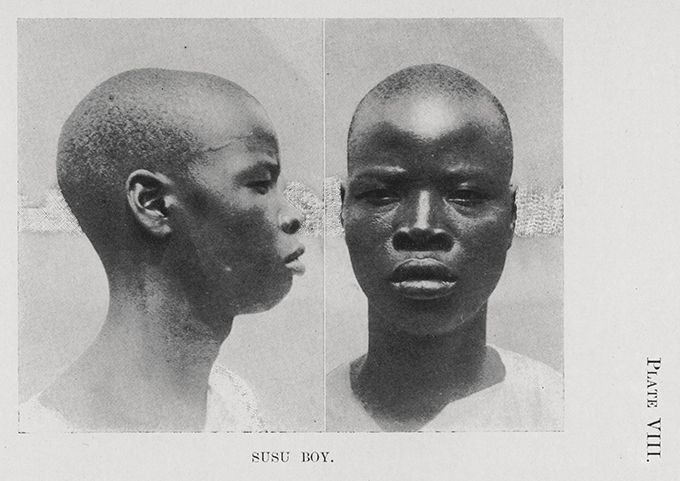 The original ‘Susu Boy’ physical type photograph published in N. W. Thomas’s Anthropological Report on Sierra Leone (1916). 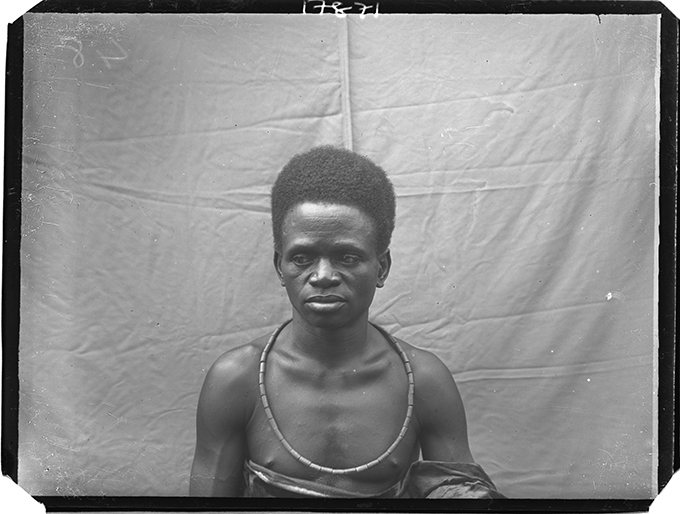 In fact, we know this is Momo Samura, photographed by Thomas in Samaia in the Northern Province of Sierra Leone in May 1914. The arm of a white man holds the number board. Although no measure or number board may be found on the published photograph or negative, I wanted to draw attention to the ‘scientific’ presentation of the subject. The numbers, the measure, the presence of the hand with the board – these are used to frame the story and to raise questions pertaining to what was happening around the subject, both literally and figuratively considering the situation that this area of the world was in at the time. Most of this – and his – story will, for the most part, remain unknown. The jumbled numbers and bright colours give a sense of turmoil in the background – even if not literal turmoil, then one coming from the nature of the study of the subject and the way we see these images today in relation to what we know of the past. 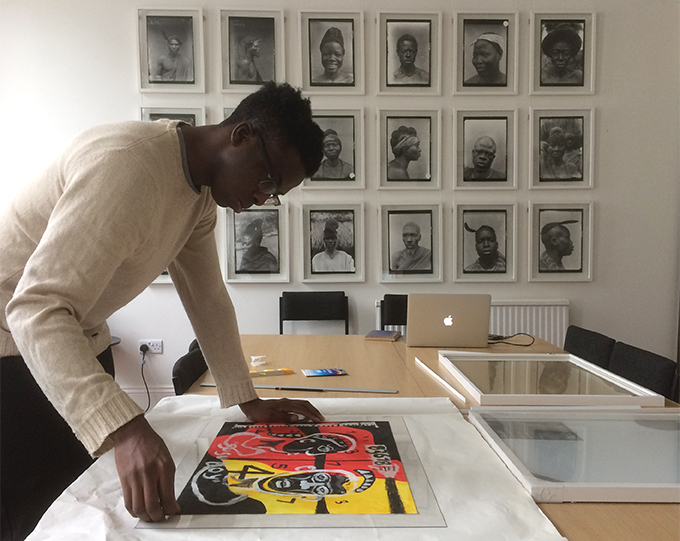 Chiadikōbi Nwaubani installing ‘Susu Boy’ as part of the Photographic Affordances exhibition at the Royal Anthropological Institute, London. Chiadikōbi Nwaubani’s ‘Susu Boy’ is currently on display alongside N. W. Thomas’s photograph of Momo Samura as part of the Photographic Affordances exhibition at the Royal Anthropological Institute. See an interview with Chiadikōbi Nwaubani at That Igbo Girl blog. [Re:]Entanglements is part of a research project entitled ‘Museum Affordances‘ funded by the UK’s Arts & Humanities Research Council. The project is exploring the legacies of N. W. Thomas’s anthropological surveys in West Africa as a way of thinking through broader issues that museums and archives are negotiating today. Ethnographic museums in particular have large collections of objects that were acquired during the colonial era from throughout the world, and which have been on display or deposited in museum stores ever since. One way of thinking about these collections, which have been dispersed from their place of origin, is through the metaphor of ‘diaspora‘. Like diasporas of people, ‘object diasporas’ are caught ‘in-between’ one place and another. Some diasporic populations regard themselves as exiles, forcibly removed from their ancestral homelands; others feel quite ‘at home’ in their diasporic location, but nevertheless have strong sense of connection and identification with the places from which they or their ancestors originated. This is often determined by the circumstances in which they or their ancestors left their place of origin. Were they taken by force? Did they decide to leave voluntarily? How might the metaphor of diaspora help us understand the status of ethnographic objects in European and North American museums? Some objects were taken forcibly – confiscated, for example, as ‘loot’ during colonial punitive expeditions. Others were purchased or exchanged. We need to think about where – and how – these objects ‘belong’. How do such object diasporas connect with diasporas of people who have links to the same places of origin? All of these issues are relevant to the Nigerian and Sierra Leonean collections assembled by N. W. Thomas between 1909 and 1915, the majority of which are held by the University of Cambridge Museum of Archaeology and Anthropology, our main partner in the ‘Museum Affordances’ project. We want to work with different communities and stakeholders in order to investigate these questions. We are also keen to contextualize our research with the object diaspora that resulted from Thomas’s anthropological surveys with other similar collections elsewhere. In order to do this we are collaborating with other museums and research centres, including the Centre for Anthropological Research on Museums and Heritage in Berlin and the Research Center for Material Culture (RCMC) in Leiden. 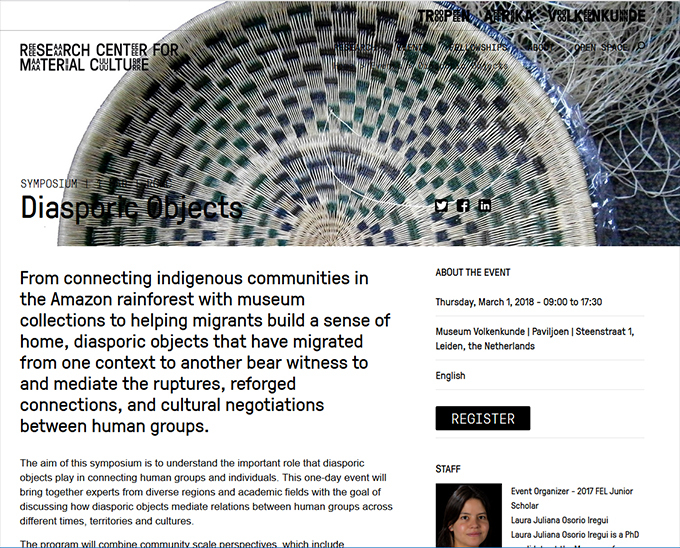 On 1 March 2018, we participated in a one-day symposium organised by RCMC on the theme of ‘Diasporic Objects‘ at the Museum Volkenkunde in Leiden. Here is a video of Paul Basu’s presentation. For further thoughts on object diasporas, please see the article below. Paul Basu (2011) ‘Object Diasporas, Resourcing Communities: Sierra Leonean Collections in the Global Museumscape’, Museum Anthropology 34(1): 28-42. Paul Basu (2015) ‘Reanimating Cultural Heritage: Digital Curatorship, Knowledge Networks and Social Transformation in Sierra Leone‘. In: Coombes, Annie and Phillips, Ruth, (eds. ), International Handbooks of Museum Studies, Volume IV: Museum Transformations. Oxford: Wiley-Blackwell, pp 337-364. 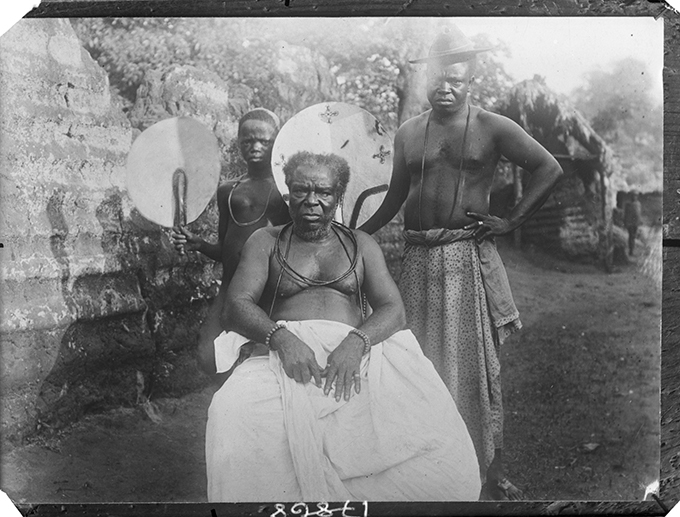 Chief Iyamu with retainers photographed in front of Egedege N’okaro, Benin City in 1909. Photograph by N. W. Thomas. NWT 1361. RAI 400.16557. Further to our post on Northcote Thomas, Benin Kingship and the Interregnum, this photograph shows another controversial Benin chief who rose to power during Oba Ovonramwen’s exile. This is Chief Iyamu, a paramount chief appointed by the British colonial administration and given executive powers over a territory to the South East of Benin City at Urhonigbe. In his history of Benin under British Administration, Philip Igbafe argues that such paramount chiefs ‘were ordinary chiefs and individuals who showed themselves to be useful agents of the British officers and had to be used to rule the extensive Benin Territories’. They were appointed ‘because they were loyal [to the British] and willing to serve, prepared to adapt to new conditions in order to retain influence, and could therefore be relied upon to do the bidding of the administrative officers’. Chief Iyamu was photographed by N. W. Thomas seated on a white horse, surrounded by his retainers, and wearing a splendid gown. 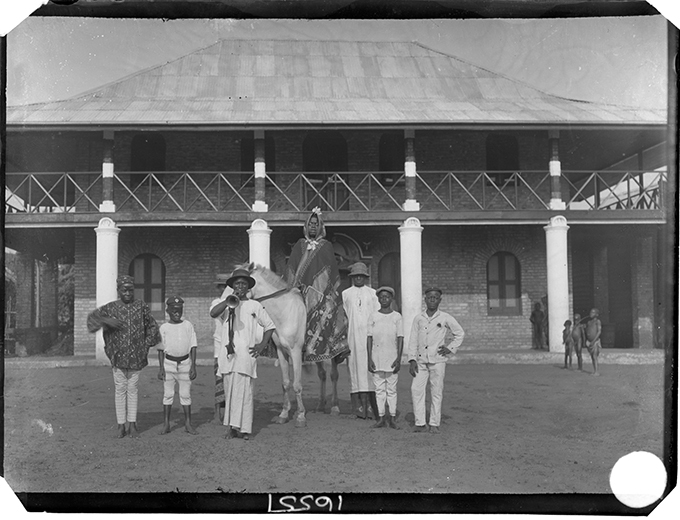 He is pictured in front of an imposing European-style house, known as Egedege N’okaro or ‘first storey building’. It was reputedly the first residential building constructed in Benin City with an upper storey. According to the Edo World website, construction of the house began in 1903-04 under the supervision of O. S. Crewe-Read, an Assistant District Commissioner, who was killed in 1906 at Owa by Ika resistance fighters. Although the circumstances are not clear, the house was given to Chief Iyamu, who completed its construction around 1905-06. Although Thomas did not record the circumstances in which the photograph was made, one can surmise that Chief Iyamu had a hand in the mise en scène. Resplendent on his white horse, posed in the forecourt of his impressive Benin City residence, here is a carefully composed display of power, prestige and status. 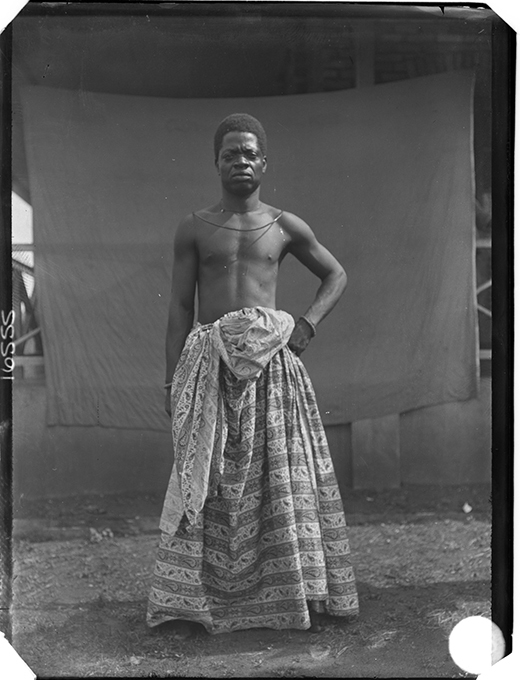 A portrait of Chief Iyamu, photographed by N. W. Thomas in Benin City in 1909. NWT 1363. RAI 400.16555. At the same time, Chief Iyamu was a controversial figure. According to Igbafe, Iyamu was among those paramount chiefs who abused the power given them by the colonial administration, and it is likely that he would have been imprisoned for his misdemeanours had the British authorities not deemed it inexpedient to do so for political reasons. Despite the people of Urhonigbe rising up against Iyamu in 1912 and 1914, he was given the title Ine after restoration of the Obaship and crowning of Eweka II in 1914. 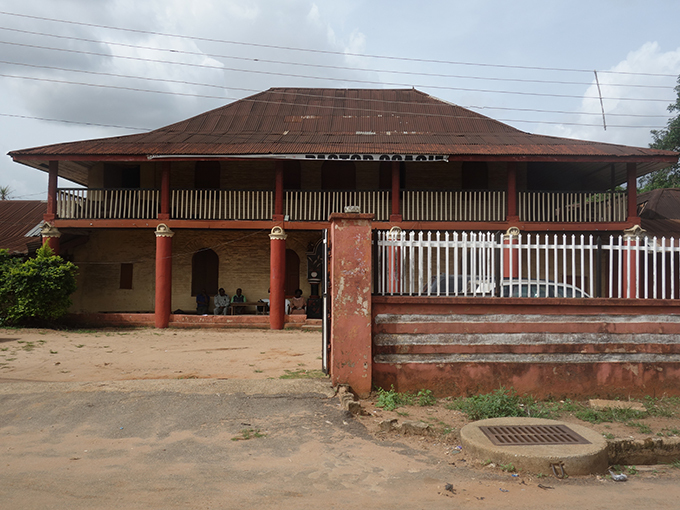 Egedege N’okaro is still standing, a well-known landmark on Erie Street in Benin City. Photograph of Egedege N’Okaro taken in 2018 from approximately the same spot as Northcote Thomas’s photograph from 109 years earlier. Photograph by Paul Basu. Many thanks to friends at the Nigeria Nostalgia Project for helping to piece together the story of this house. Earlier generations of anthropologists have been criticised for their failure to properly account for the historical contingencies that frame the context of their fieldwork. In their writing they often represented the societies they studied as if they existed outside of time, evoking customs and cultural practices as if they had remained unchanged over the centuries. For anthropologists of Northcote Thomas’s generation, there was a further paradox insofar as they worked within a ‘salvage’ paradigm, documenting and collecting cultures that they believed were on the brink of extinction due to the incursion of European influence. Thomas acknowledged that colonial contact was destructive, but he did not question whether it was also inevitable. Thomas arrived in Benin City at a time of tumultuous change, just twelve years after the sacking of the city during the Benin Punitive Expedition of 1897, in the aftermath of which Oba Ovonramwen was exiled to Calabar. Benin’s monarchy was eventually restored in 1914, when Ovonramwen’s son, Prince Aiguobasimwin, was installed as Oba Eweka II, but the interregnum between 1897 and 1914 was characterised by fierce political rivalry between different factions. This rivalry was played out in the context of the new political system introduced by the British colonial authorities, which included the appointment of a Native Council and so-called paramount chiefs. While purporting to respect traditional power structures, this system of ‘native administration’ weakened the indigenous system of government, creating new tensions and rivalries. This was the fraught political context in which Thomas’s first tour as Government Anthropologist took place. Reading Thomas’s official report of this tour, his Anthropological Report on the Edo-Speaking Peoples of Nigeria, published in 1910, one is struck by the absence of any discussion of political structure. Indeed, given the primacy of sacred kingship in Edo, and the elaborate rituals that surround it, it is remarkable that Thomas should not devote a chapter to the subject in the report. It is important to remember, however, that Thomas’s reports were effectively British government publications, intended primarily for distribution to colonial officers. It is perhaps not surprising that they omitted such a controversial issue as kingship. In fact, it appears that Thomas intended to write a more detailed account of Edo-speaking communities in Nigeria. An incomplete manuscript survives, which we will be piecing together as part of the [Re:]Entanglements project, that does include a chapter specifically dealing with kingship. This address such matters as the origins of kingship in Benin, the relationship between the Oba and the Uzama chiefs, rituals around succession and so on. The account does not, however, make mention of the destruction of the Oba’s Palace in 1897 or the dethroning of Ovonramwen, who was, after all, still living in exile at the time it was written. While Thomas was silent on colonial politics and contemporary power struggles among Benin’s elites, he was evidently granted audiences with and photographed many of the key figures involved. These included Chief Obaseki, Chief Ezomo, Chief Ero, Chief Osula and Chief Imaran. Chief Obaseki was close to the British administration and came to dominate the Native Council during the interregnum. He was ambitious and opposed the installation of Aiguobasimwin as Oba in 1914. Chief Ezomo and Chief Ero had been among the seven Uzama chiefs, and had played important roles within the pre-1897 Benin government. During the interregnum, these chiefs were all members of the Native Council. It is possible that Thomas’s are the only photographic representations of these important figures in the history of Benin. If Thomas himself was an unreliable witness to these events, his photographs, at least, constitute a unique historical record. Igbafe, P. A. 1979. Benin under British Administration: The Impact of Colonial Rule on an African Kingdom, 1897-1938. Longman.